What is an 'app invite code' and how do I set it up? Make sure your customers in the HouseCall consumer app are linked to your Pro account. The app invite code is a single word or condensed phrase that your customers can use to link their customer accounts to your HouseCall Pro account. This will ensure they see only your business as a booking option when in your specified field on the customer app. To create your invite code, go to your Account Settings by clicking the user icon in the top right of your dashboard. You can then click the 'edit' button next to your business name. This will bring you to the window where you can edit all of the business information. In the bottom right you'll see the 'app invite code' field. You can type whatever you'd like your code to be (as long as it does not have any spaces) and the hit the 'save' button in the bottom right. 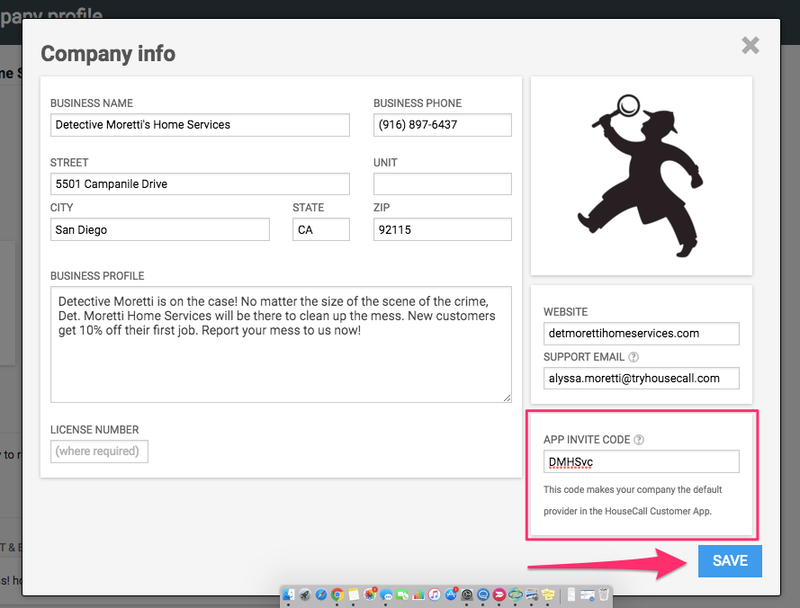 Once you have your code set up and sent to your customer, they can enter it into the Housecall customer app by following these steps.